Neumann: Opel will bring more EVs. FRANKFURT -- Opel CEO Karl-Thomas Neumann will remain in his job under new owners PSA Group and will press on with plans for more EVs and a flagship SUV, he told a German motoring magazine. "It is important for me to stand before employees and show leadership. I have done this in the past and will continue to do so," Neumann told auto motor und sport, adding he would work with PSA's CEO Carlos Tavares. "I think we have great respect for each other. That is why I see a good foundation for continued cooperation," the magazine quoted Neumann as saying. Neumann said Opel will continue to have its own leadership, its own design and develop its own cars, even though its future products will be underpinned by PSA's platforms instead of GM's. The transfer to PSA platforms will take several years, he said. He declined to comment on a report that he was planning to make Opel a pure electric car brand before General Motors decided to sell the automaker to PSA but said that Opel planned more EVs alongside the Ampera-e long-range EV, a sister model to the Chevrolet Bolt. Opel will be allowed to sell not just the current version of the Ampera-e but also follow up models, Neumann said. Opel will also continue with its plan to launch a new SUV that will be its second flagship model alongside the Insignia midsize sedan, he said. Opel will launch all 7 new models planned as part of its biggest ever product offensive, Neumann said. Neumann said he was skeptical about introducing the Opel brand in China. "The Chinese market is no longer the cure-all to help solve the problems on all the other markets," he said. 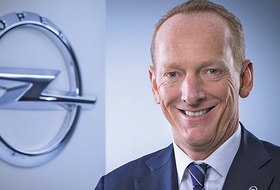 He said his first priority would be to make Opel profitable in Europe by deepening cooperation with PSA rather than using resources to build up Opel in Asia. Earlier this month, PSA agreed to buy Opel and its UK Vauxhall business from GM in a deal valuing the business at 2.2 billion euros ($2.3 billion), raising questions about Neumann's future. At a press conference announcing the deal, Tavares said: "It is our intention to make sure Mr. Neumann continues the excellent work he has been doing. We trust that he will be in the best position to lead the turnaround and a profitable future for Opel." PSA has pledged to run Opel as a separate company with separate management, while exploring opportunities for expanding sales of Opel cars beyond Europe.